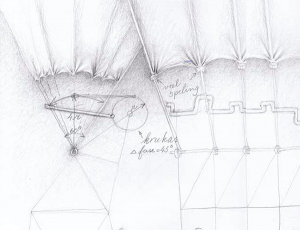 Fragment of an illustration by artist Theo Jansen. 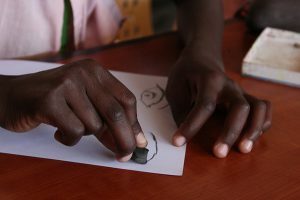 An extensive educational program with workshops and activities based on Jansen’s concepts and work has been designed to encourage creation, research, a greater understanding for nature and its wildlife through observation, and the proposing of solutions through art in the face of the challenges that accompany a constantly changing environment. 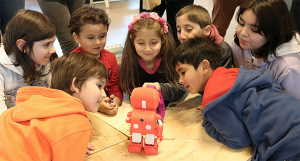 Workshops on biomimetics, robotics, programming, 3D scanning, creativity, observation, and performance for children and teenagers ages 6 to 18 and young adults 18+ will take place in Santiago from May to June of 2018. The workshops will be developed in collaboration with FabLab University of Chile, FabLab Catholic University, and Cerrillos National Center for Contemporary Art. They will be held in Cerrillos Center and GAM Cultural Center, prior registration is necessary because they have a capacity limit. During the second semester of 2018 the Educational Program will be implemented in different regions of the country. Activities will be carried out in collaboration with Ecoscience Foundation and the CECREA Centers of the Ministry of Cultures, Arts and Heritage of Chile. *Workshops will be conducted in Spanish. If you’d like to sign up to the workshops implemented by FabLab University of Chile and FabLab Catholic University described below, click here. The human being has always observed nature as a source of inspiration when looking for new materials, methods, processes, algorithms, structures, tools, mechanisms and designs. Biomimicry is the discipline that studies nature as a source of inspiration for new technologies that solve problems that nature has already solved efficiently. In this workshop, we will explore together with the participants the world of technological innovations inspired by nature in order to discuss, develop and make new biomimetic technologies. Robotics and programming are creative tools considered fundamental today in the education of children of the future. SIMA Robot is a physical artificial intelligence platform that brings children and teenagers closer to the world of robotics and programming, transforming a smart phone into a fully interactive social robot, capable of listening, moving and expressing itself. The workshop provides theoretical-practical tools for the construction and programming of a robot, with which they can interact with at the end of the session. Kinetic sculptures invite viewers to move and capture the reality of the work, each visual perspective providing different information. To achieve the effect of movement, the artist has the possibility of using very different technical resources. 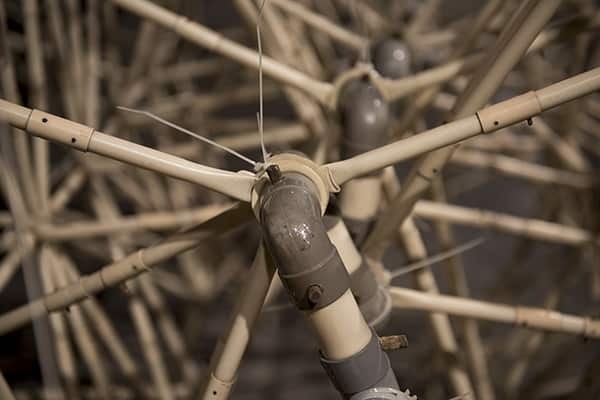 In this workshop we propose to discover kinetic sculpture as a work that integrates art, design, and engineering, through a practical experience of designing and manufacturing a mobile structure through the materialization of 3D prints. We invite participants to explore the world of digitalization, scanning and 3D printing. In addition to knowing the technologies, they will be able to scan themselves and even some structure of Theo Jansen’s work. 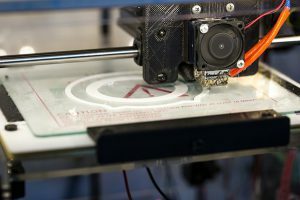 Afterwards, the 3D printing technology will be displayed and the scanned objects will be printed. To understand robotics in a practical and entertaining way, robots will be assembled with movements that are able to recognize an obstacle and avoid it, with forms similar to those of the work of Theo Jansen. 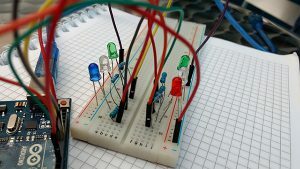 The workshop involves the use of Arduino and ultrasonic sensors. 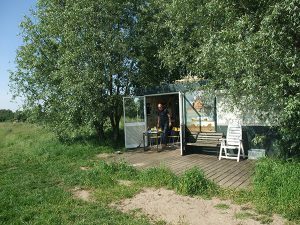 In this workshop, the participants will be able to replicate the notions of Theo Jansen’s work to create small structures propelled by air assembled with pieces made with laser cutting and/or CNC milling in wood. 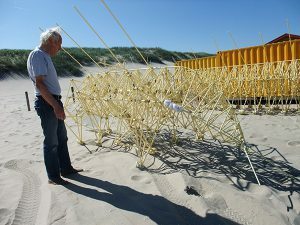 From basic notions of 3D digital animation, virtual robots will be created based on how Theo Jansen used animation software to virtually prototype his first Strandbeest. In four sessions, the participants will develop an animation from a mechanical approach, linked to digital simulation. At the end of the course each participant will have virtually built their own robot, learning notions of physics and mechanics along the way. The following workshops will be implemented by the mediation team of the Cerrillos National Center for Contemporary Art. 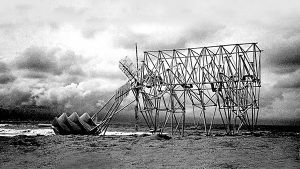 A space for creation and reflection on the work of Theo Jansen that proposes observation as the engine that propels scientific and technical development, as well as artistic practice. 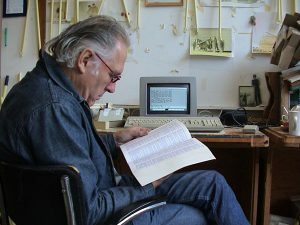 What and how to observe: the focus will be on observing Jansen’s work as living bodies, practicing movement and mechanics through drawing and conscious body movement. 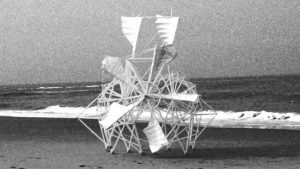 Create, analyze, learn and have fun revising the work of Theo Jansen: a participatory activity where participants must conceptualize a spawn that depends on wind to exist. 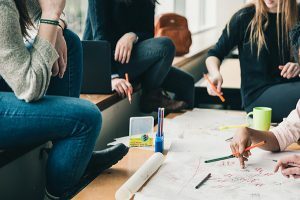 Alternating roles within the group work is encouraged for a playful experimentation in which error is an opportunity to evaluate the decisions during the process. After the laboratory, the “creatures” will be exhibited at the Cerrillos Center. This activity seeks to collectively build a human machine, and its biggest challenge includes movement. From observation, repetition and collaborative work, the body will be understood as an instrument that allows for the creation of new forms or animaris. 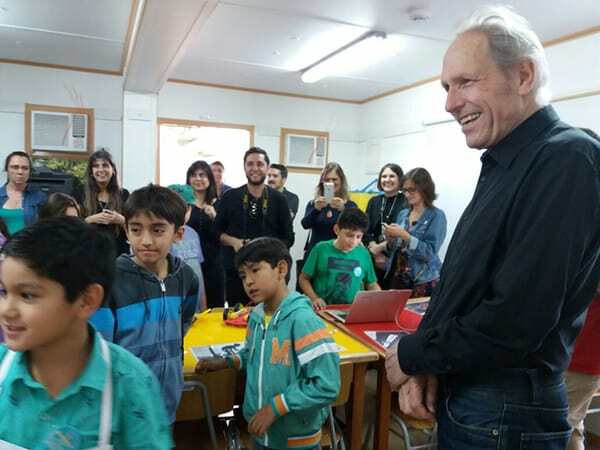 Designed together with the Fablabs of the University of Chile and Catholic University, and in partnership with the National Center of Contemporary Art Cerrillos and the CECREA Centers of the Ministry of Culture, Arts and Heritage, the educational program offers workshops for children and young adults that will take place across the country.